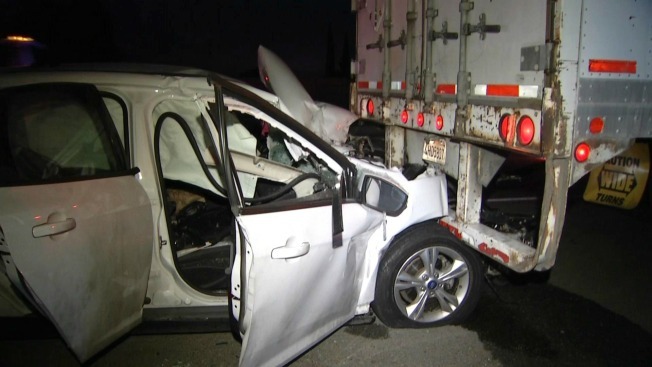 A driver not wearing a seat belt suffered moderate injuries after slamming into a semi-truck along Highway 101 in San Jose early Monday, according to the California Highway Patrol. The injury crash occurred just before 4:30 a.m. on northbound Highway 101 just north of Blossom Hill Road, CHP Sgt. Daniel Hill said. Initial reports to law enforcement indicated that the driver was trapped in a burning sedan after smashing into the truck, Hill said. When first reponders arrived, they pulled the driver from the car, but the car was not on fire. The male driver likely suffered broken bones and a head injury, but "he's otherwise OK," according to Hill. "Based on the extent and location of the damage, it's pretty impressive he came out with almost no injuries," Hill said. The crash temporarily blocked the far right lane of the highway.